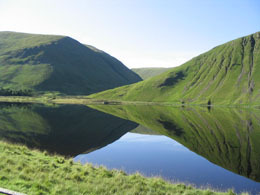 A part of the Tweed project is to deal with the tangible remains of works associated with the construction of Talla Reservoir. The construction of the dam and the pipeline to Edinburgh was a major engineering feat in the early 20th century. Construction, between 1897 and 1905, of the Talla Reservoir, a major feat of engineering, led to the drowning of an archaeological landscape. Accessible at the south-eastern end of the reservoir during periods when the water level is lowered, this has not yet been fully surveyed. In addition, the present condition of the surviving remains of the works associated with the construction of the reservoir and the pipeline that carried its water to Edinburgh has yet to be assessed. The course of the construction railway from Broughton, is still traceable and a series of bridges built to carry the line and to allow animals to pass over it are worthy of a detailed record. 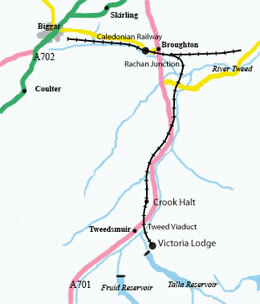 Starting from Caledonian Railway metals at Rachan Junction, near Broughton station (originally part of the Symington, Biggar and Broughton Railway‘s network), the railway line survived the completion of the dam but was closed in 1910. The course of the pipeline underground is marked on the surface by a number of concrete surveying pillars that have intrigued many travellers passing along the Broughton – Moffat road. Explosives stores are another feature and are found on the sides of valleys, as at Logan, where the pipeline briefly surfaces. Preliminary investigation indicates that many of these features, constructed more than a hundred years ago of poured concrete and, in the case of the bridges, of steel, are decaying now. They were, after all, only intended to last until construction of the dam was complete. The temporary railway line carried 100 000 tons of material to the reservoir site but the vast bulk of material used in the construction of the dam wall was quarried from within the area of the reservoir. This was for reasons of economy and also because it increased the capacity of the reservoir. Most of this stone and gravel must have come from the north side of the Talla Water and the evidence of the extraction may be seen during low water periods. South of Gameshope, Burn an extensive archaeological landscape survives, both above and below the high water level. It seems reasonable to assume that many other features may have been destroyed without record during the quarrying operations and that the size and significance of what is still a major ritual landscape of Bronze Age activity would have been even greater. 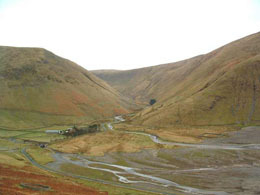 It is a sobering thought that up to 33% of the archaeological landscape at Talla may have been obliterated.